Using fun preschool learning activities can help lay strong foundations for reading, writing and arithmetic. These playful educational activities will give your child a chance to develop the skills needed for formal schooling through carefully chosen playtime activities! 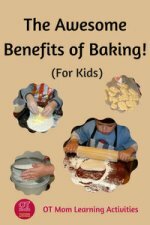 Click on each link to find out how and why these activities can help your child, and get some easy ideas to do at home. Gross motor activities can develop the hand-eye coordination needed for handwriting and also the visual skills needed for reading. Building core strength and upper body strength is an important factor in developing the skills needed to control a pencil and scissors. Take your child to a park at least once a week. Encourage lots of climbing to work those shoulder and core muscles! Invest in a trampoline. Jumping is not only a great way for preschoolers to burn off steam - it also works on core muscles and coordination skills, and gives your child lots of heavy muscle and joint input. Jumping on a trampoline can calm an overworked child AND it can help a distracted child to sit down and concentrate. Try some fun relay games where your child has to pass an object over the head or sideways. 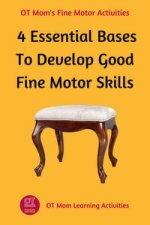 View a range of gross motor activities on my site! 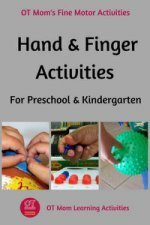 During the preschool years, your child should be getting lots of opportunity to develop hand strength and dexterity through exposure to a variety of fine motor activities. If your child is generally able to play well with small items and is learning to manipulate crayons and scissors, then most fine motor activities advertised for this age group will be achievable for him/her. Do Activities Like This Frustrate Your Child? But what if your child avoids using a crayon and scissors and is clumsy with small items like beads? if that is the case, then many fine-motor-based preschool learning activities may end in frustration and tears. This may be an indication that your child's hand and finger muscles need some help. Encourage your child to squeeze, pound, roll and squash playdough, instead of just pushing cookie cutters into it. These are some of my playdough activity ideas. 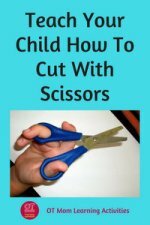 This article will help you teach your child to cut with scissors. 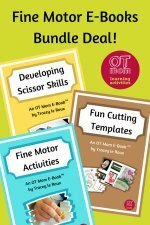 Check out the links to all my fine motor activities, or consider buying my fine motor e-books for all my fine motor activities in an easily accessible format! Getting the eyes and hands to work together well is important for playing sport as well as for getting the eyes to guide the hands in handwriting. Your daily schedule of preschool learning activities should always include a visual motor item! Suspend a ball in a net and have your preschooler hit it with a bat. Do lots of threading, beading and lacing, with thick laces and chunky beads. Draw a pattern on a blackboard or white board and have your preschooler trace over it with a finger. 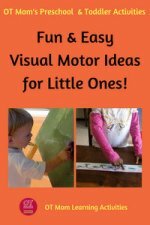 Get some more great visual motor integration activities over here, or try these very easy ones with your toddler. Visual perceptual activities will help your child to understand and remember what is seen. This is an important foundation for learning to recognize and remember letters and numbers in order to read, write and do math! 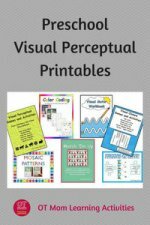 Doing some of these fun preschool learning activities will help to develop many of your child's visual perceptual skills. Play the verbal "I Spy With My Little Eye" games indoors and outdoors (use the sounds of the beginning of the words, not the name of the word...ie "buh" for ball, not "bee" for ball!). Playing this game will help your child to focus and pay attention visually. Look at "I Spy" or "Seek and Find" books together and help your child to spot the different objects. This is a figure-ground perception activity. Partially hide familiar objects and ask your child to identify them. This is a visual closure skill. Play Concentration to work on visual memory skills. (If you can't find "Seek&Find" or similar books in your library or bookstore, Amazon has some over here that work well for very young kids. If you want a slightly harder version, try this one . Preparing for handwriting does NOT mean plonking your preschool child down with a pencil and paper and showing how to write his/her name! Preschool learning activities should always include lots of movement, floor work and "big" work - working on boards instead of on paper at a desk. 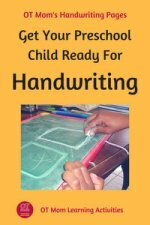 Preparation for handwriting is no different, and I have put together an in-depth page full of activities and suggestions that will help your preschool child to work on the foundation skills needed specifically for handwriting. 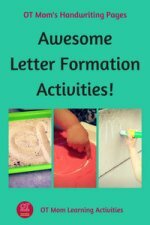 So head over to my preschool handwriting page to find out more! 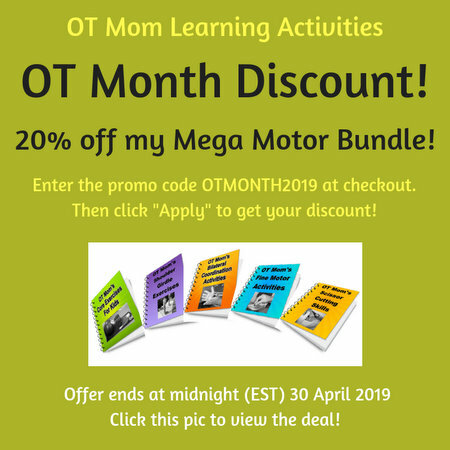 You may also be interested in checking out a whole range of preschool educational activities that have been compiled by an expert in her field over at Empowered Parents! Enjoy! 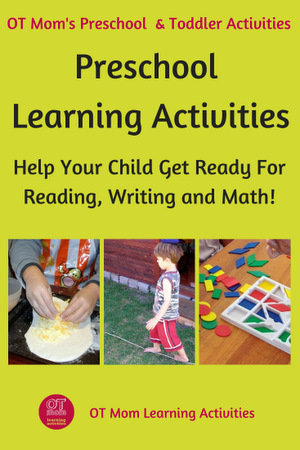 I hope these preschool learning activities will be helpful to you as you work with your preschool child! Why not sign up for my free, occasional newsletter to stay in touch with new activities and pages as they come out?